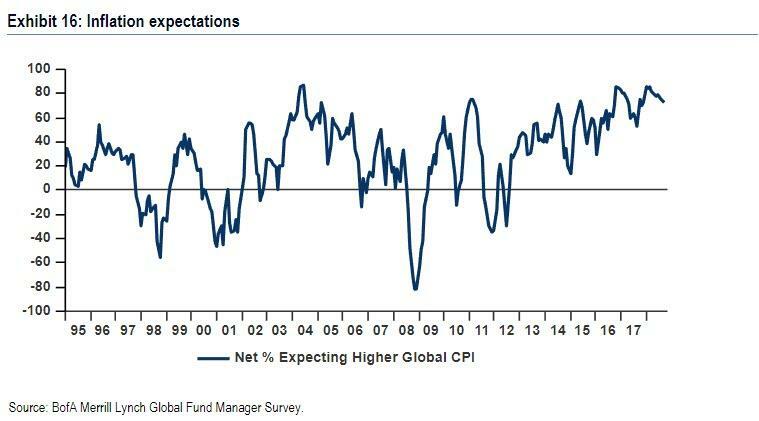 The latest Fund Manager Survey from Bank of America's Michael Hartnett, which polled a total of 174 respondents with $518BN in AUM between October 5 and 11, painted a starkly bearish picture about the global economy: according to the poll, a record 85% of survey respondents think the global economy is in the late cycle, 11% above prior highs in Dec. ‘07. 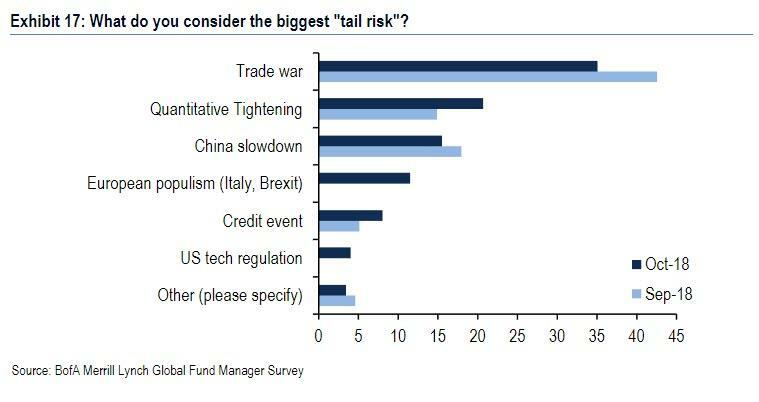 "Investors are bearish on global growth," said Michael Hartnett, BofA's chief investment strategist, "but not bearish enough to signal anything but a short-term bounce in risk assets." 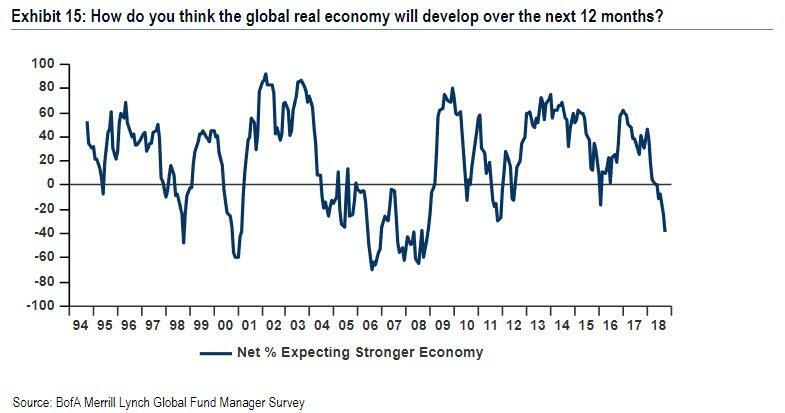 Furthermore, when asked how the global economy will develop over the next year, net 38% of respondents expect deceleration, the worst outlook on global growth since Nov. ‘08. How can growth optimism be so weak with the US booming? 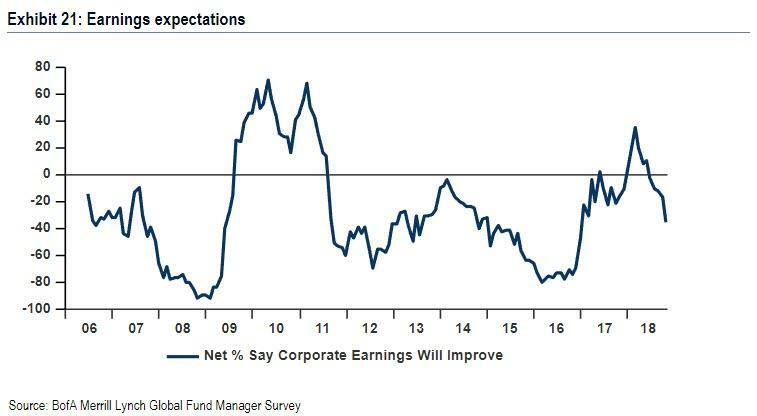 Because, as Hartnett notes, Fed tightening is "causing US hopes to wane" with the gap between US and RoW forecasts widest since Oct'07 (see below) FMS shows 2nd highest reading of "excess" corporate leverage since '10. 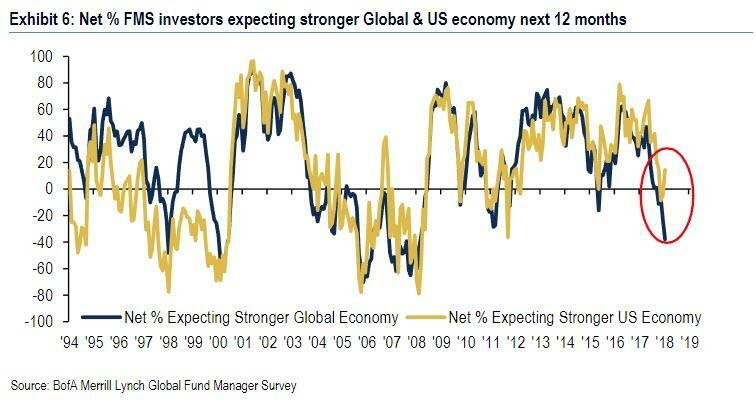 Yet even with global growth expected to post a sharp slowdown, the decoupling between the US and the rest of the world continues, with the disconnect between FMS investors expecting a strong US economy and weak global economy at widest since Oct'07. Still, with a sharp slowdown in global growth expected, it is hardly a surprise that when looking at corporate earnings, a net 35% of respondents indicated they do not expect an improvement of 10% or more in the next year, a significant slowdown from net 35% expecting improvement from February’s survey. 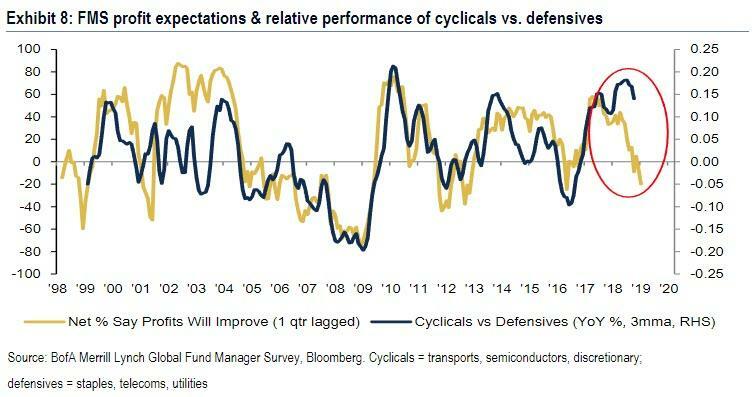 Additionally, profit expectations continue to slide, dropping -13ppt to -20%, the lowest since May'16, signaling notable underperformance ahead for cyclical vs. defensive sectors. 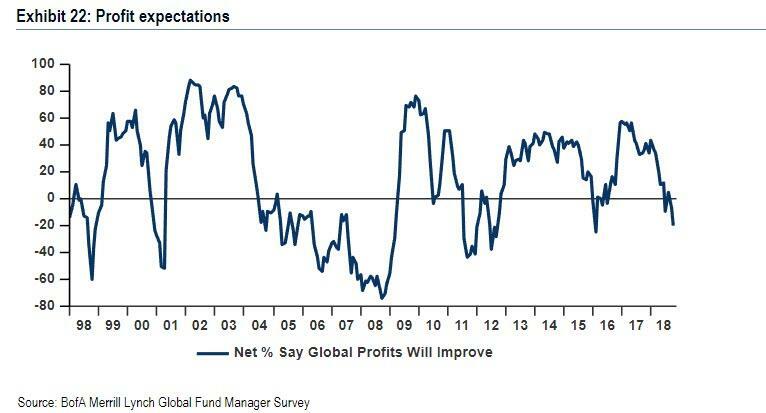 Adding to this, a net 20% think global profits will deteriorate in the next 12 months, a 2-year low and major reversal from 39% saying proifts would improve in Jan '18. Looking ahead, professional investors expect a inflation to keep rising, with a net 73% expecting core CPI to rise over the next 12 months, but conviction has slipped since the recent peak of 82% in Apr '18. 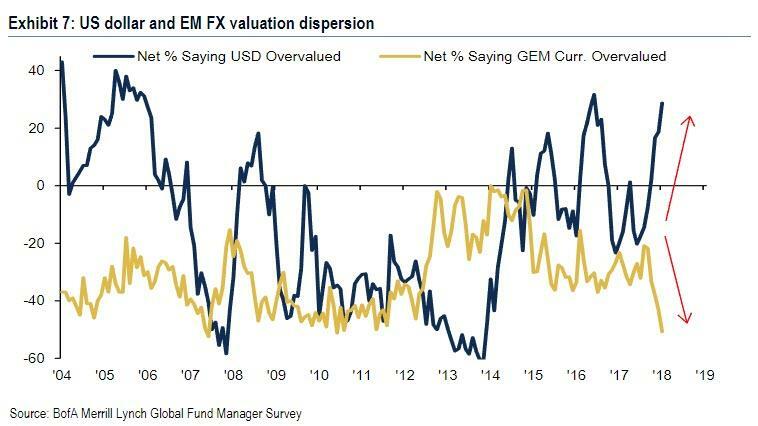 Paradoxically, even as they expect inflation to keep rising, investors think the USD is very overvalued, notably against EM currencies which are seen as never having been more undervalued in survey history. 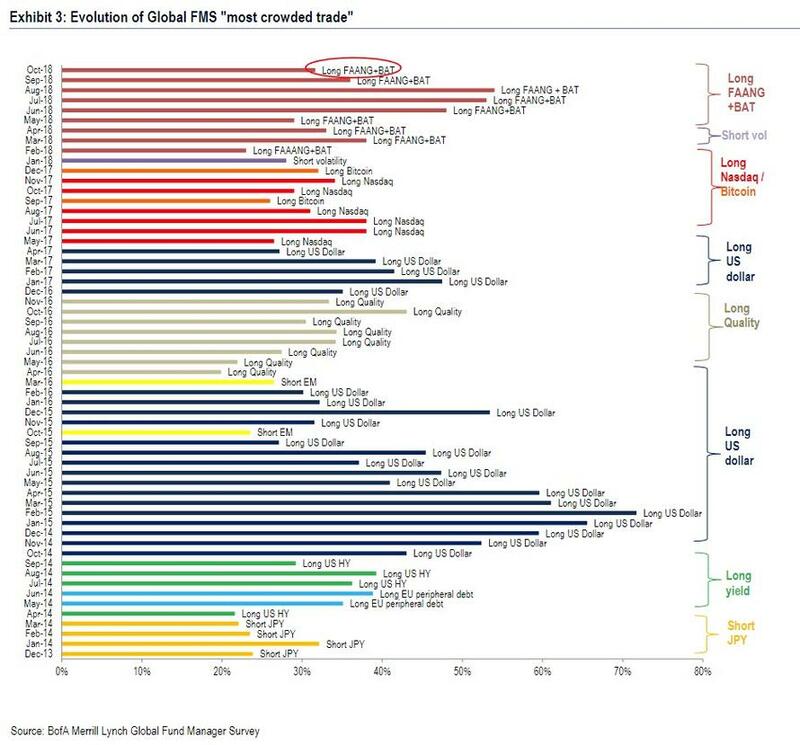 Meanwhile, for the ninth straight month, “Long FAANG+BAT” (32%) remains the most crowded trade identified by investors followed by “Short US Treasuries” (19%) and “Long S&P 500” (18%). 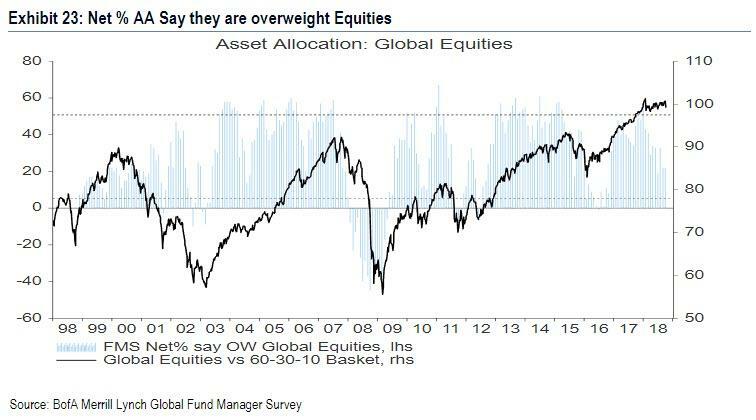 In light of these risks and fears about the global economy, investors' allocation to global equities held steady at net 22% overweight, close to July’s recent low of net 19% overweight. 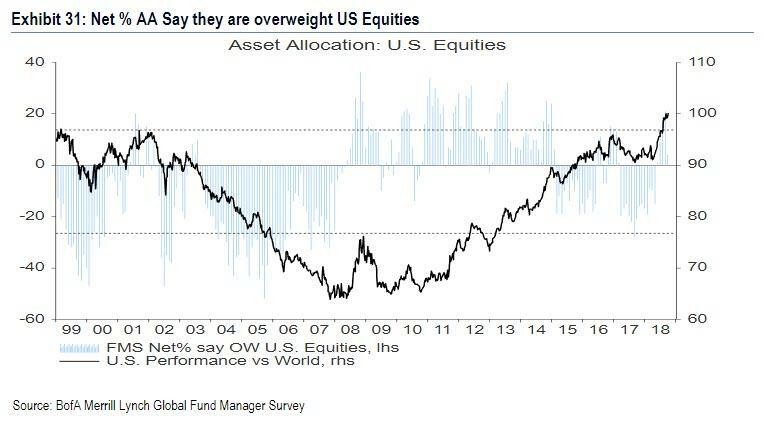 Perhaps spooked by the recent surge in US volatility, investors told BofA that their allocation to US equities reversed much of the climb from the past two months, falling 17% to net 4% overweight, with the US losing out to Japan as most favored equity region globally. 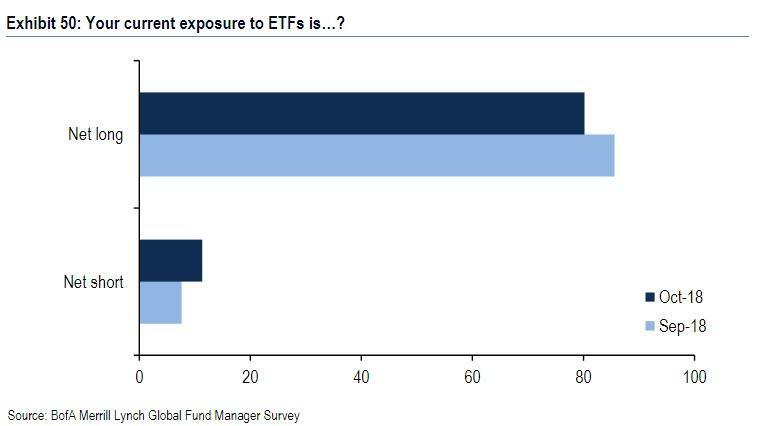 In a special set of questions focusing on ETF investing, BofA founds that 20% of investors have AUM allocated to ETFs, and while only 14% allocate more than 41%, this is higher than 11% ETF allocation of BofAML private clients. 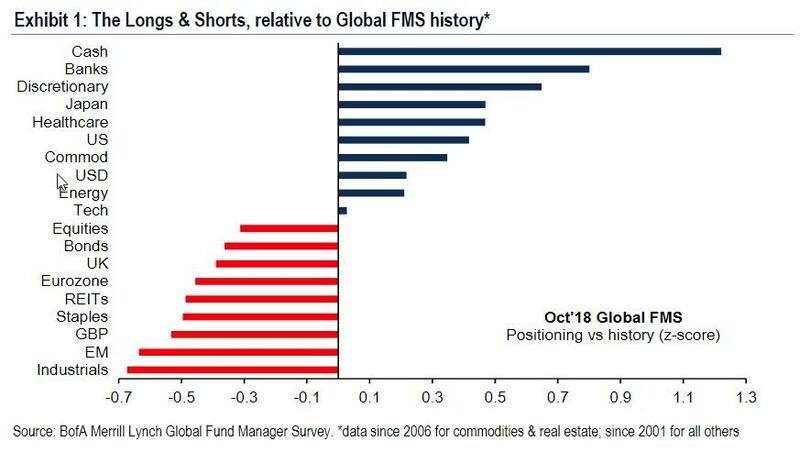 Meanwhile, 80% of FMS investors that use ETFs are net long, down 6ppt MoM, while 11% are net short, the highest since BofA started the survey in May'18. 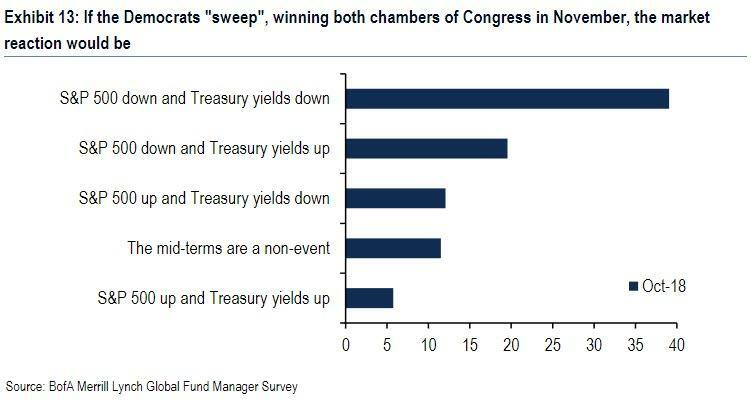 Looking ahead, 59% of FMS respondents think the S&P would fall if the Democrats take both chambers of Congress; only 6% think yields and equities would rise. How are investors positioned? Respondents said they bought energy and materials stocks while divesting growth and cyclical names in October - something we saw with great clarity during last week's sharp rotation - with the overweight position in technology stocks sliding 6 percentage points. Cash levels held steady at an elevated rate of 5.1 percent. 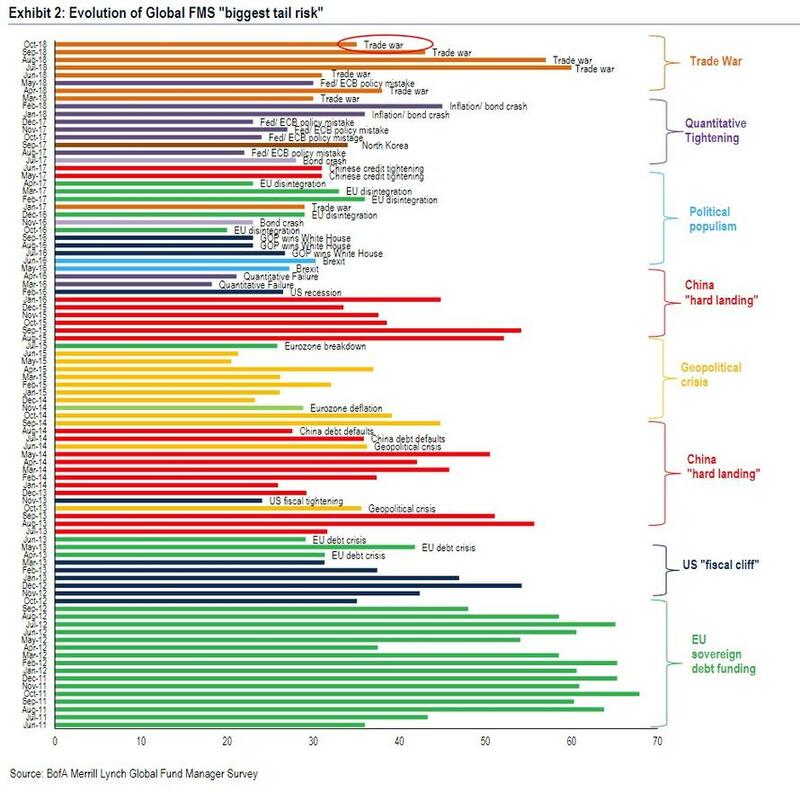 Finally, Hartnett lays out the October FMS contrarian trades: Long China (e.g. FXI) short US (e.g. SPY), long EM (e.g. EEM) short FAANG (QQQ), long industrials (e.g. EXI) short financials (e.g. IXG), long REITS (e.g. REET) short cash (e.g. BIL).